Ichinose Shiki(CV. 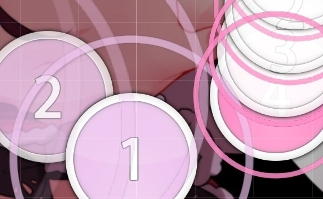 Aihara Kotomi) - Himitsu no Toware · forums · community | osu! 01:46:766 - The snapping of keyboard synth here is quite off. On higher diffs that may following this should be aware of it and make a detour to avoid potential problem. 00:14:878 - actually I would prefer n-Finish rather than s-Fin due to 1) consistency considering 00:21:591 and 2) This timing point also features a very low bass in the music, and a hs with lower pitch seems fits better (mentioning 00:21:591 again). Please apply this to other s-Fin in the section (A melo, 00:35:018 ~ 01:00:193) if you adapt it. 00:10:472 - +circle to make the rhythm consistent with 00:08:794 (2) for 1) In the whole section there is no gap >1 beat except this and 2) 00:08:165 (1,2) may potentially affect the reading of rhythm for beginners. 00:29:563, 00:30:193 - +whis ; 00:29:773, 00:30:403 - -whis - assuming that "Chu" in vocal = whis. 01:53:899 (1,2,3,4,5) - repeating Kirisakiii, should be three circles + 3/4 slider if following synth. Seems that you want to keep the consistency of kick drum on 01:54:319, a 1/4 slider on 01:54:214 w/ circle on 01:54:528 could be a good alternative imo. 00:27:990 - There should be also a very short kick slider here (based on the music and 00:27:046 (1)). While there is a similar pattern at 00:48:130, that one is ok by that kick is nerfed by other elements in the music. 00:45:298 (2) - Maybe not having a good flow here (yes you had a similar harsh angle in 00:45:927 (4), where you need to make a contrast based on music so it plays well while this one doesn't). Mind the frequent direction change on 00:44:668 (4,1,2). 01:33:759 (1,2,3,4) - With the vocal having different rhythm, a same rhythm combination would not be enough to represent the element in the song. 01:49:703 - Rhythm issue that similar to the 00:07:326 (4) one. This time you can make 01:49:493 (3) reverse one more time to cover this timing point. 01:16:242 (2,3) - It's clear that you are following those synth sound effect by these sliders, while following drum seems more natural and reasonable because 1) You are following drum at 01:15:298 (1,2,3) and 2) Musically, this harsh contrast seems not foreseeable by players, which could be applied to the map based on this theory. Last edited by Curisu March 16, 2017 at 9:35:25 PM GMT , edited 1 times in total. 00:27:990 - There should be also a very short kick slider here (based on the music and 00:27:046 (1)). While there is a similar pattern at 00:48:130, that one is ok by that kick is nerfed by other elements in the music. i wanted to make it easy. Audio is 128kbps, have you tried looking for better versions? Slider end on blue tick? 01:56:417 (2) – I know the sound actually ends on blue tick, but you can simply it to the white tick without a problem here. It’s a bit offscreen too 00:54:319 (5) – but not too much, just move it up a bit more. Cool sliders shapes for a normal diff. This slider is a bit offscreen 00:13:200 (1) - . Do you think you can rotate it a bit more? Just a suggestion, it’s not a major issue since most players can read this I suppose. What do you think of ctrol+g this slider 01:46:766 (7) - ? It’s 3/4 length repeat slider, so it ends on the tail not on the head which can cause a bit of confusion in terms of how it currently is flowing. Just like I mentioned in general, the usage of 1/8 gap is very important for the mapset spread, since this is the diff that will introduce that concept of gap for players. You should try to use it only on very noticeable and emphatic parts of the song. Good examples is how you mapped them here 00:14:458 (2,1) – this part is strong enough to accept the 1/8 gap. My concern is about this other two parts 00:18:235 (1,2) - /00:38:375 (1,2) – because here you left a 1/8 gap in a rather calm part of the song with the buzzsliders. I strongly recommend you making the gap 1/4 or decrease the spacing a bit more. Consistent diff, great job too. The overlap here 01:36:486 (3) -/01:37:116 (1) – can be a bit more polished, rotate this slider 01:36:486 (3) – “-2” . This slider 00:32:815 (6) – should end on the white tick here 00:32:920 – instead of the 1/8 snap, mainly because that’s the where the strong beat is 00:32:920 - .Also, since you’re switching back to regular white/red polarity, leaving the gap here 00:32:815 (6,7) – 1/2 beat apart is the best way to go, since the spacing as it is now really leads the player to believe that the gap he’s playing is 1/2 or 1/4. The spacing change here was a bit unexpected 00:47:815 (2,3,4) - . Are you emphasizing 00:48:025 (4) – through spacing increase? Small suggestion about this slider 00:42:151 (2) - . I believe you can avoid its “overlap” 00:41:521 (3,2) – by just using the same shape of this slider 00:41:207 (2) - . Just copy paste this previous slider then ctrol+h and rotate it “-4”. Imo it looks a bit more polished. Great diff too , I love the repeat and buzzslider usage to give the song emphasis, my favorite part was the stream going with vocal here 00:53:479 (1,2,3,4,5,1,2,3,4,1,2,3,1,2,3,4,1,2,3,4,1,2,3,4,1,2,3,4,1,2,3,4,1,2,3,4,1,2,3,4,1,2,3,4,1) – epic. What’s your thoughts over making this sliders 00:18:025 (4,1) – have different hitsound volumes? Both of them currently sound like buzzlsliders that covers the background noise, however I feel like the second one 00:18:235 (1) – is bit stronger and could be more emphasized. A really simple way to do that is increase the buzz sound of it with a inherited point. I would add a 70% volume here 00:18:235 – and a 80% 00:18:654 – then switch back to 50% here 00:18:864 (3) - . Is the flow intended to break here 01:12:780 (4) - ? Couse it could flow way better with a simple ctrol+g there and keep the movement simple inside this section 01:11:941 (1,2,3,4,5) - so you can break it only on the transition comes here 01:13:410 (5,1) - . Both of this possibilities map the vocal lines in a similar way. There’s also the possibility of making this kickslider 01:24:528 (7) – but that’s totally optional. Are you sure about ignoring the 1/8 snap usage here 00:34:389 (9,10,11,12,13,14) - ? There’s also the possibility of making this kickslider 01:24:528 (7) – but that’s totally optional. i mapped most of the synth in the way of putting fast slider, and 01:23:689 (1) - has it, while 01:24:109 (3,4) - doesn't. not mainly followed the vocal here. Such a great diff, I had a lot of fun testplaying this. Thanks a lot for the map thanks! Just a suggestion, it’s not a major issue since most players can read this I suppose. Good idea imo. Great linear flow diff, as expected of rui :> . 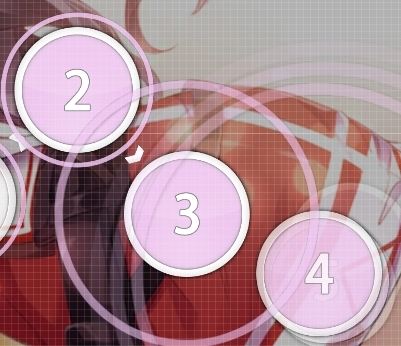 I’m still waiting for when you start mapping cool insane/extra diffs like Marionette no Kairaku again o/ Thank you Net0. I'll make a beatmap of vocaloid song after a long time. What do you think of ctrol+g this slider 01:46:766 (7) - ? It’s 3/4 length repeat slider, so it ends on the tail not on the head which can cause a bit of confusion in terms of how it currently is flowing. i think it's fine. because hold the cursor when play it. 01:47:396 (3) - is it really 1/6? 01:20:123 (6) - I think the pattern should be split here cause of vocals. maybe something like http://lasse.s-ul.eu/F1sjgfzr.jpg ?